A planet is said to be under the beams when it comes within a certain range of a conjunction with the Sun. When a planet is under the beams its light is completely overwhelmed and obscured as a result of its close proximity to the Sun. The exact range in which a planet becomes visible or invisible based on its proximity to the Sun varies based on the planet involved, as well as other factors such as atmospheric conditions. However, astrologers during the Hellenistic tradition used a standardized range of 15 degrees on either side of the Sun for a planet to be considered to be “under the beams”. Therefore, in most ancient Greek and Latin texts from the Hellenistic and Roman period, when a planet is said to be under the beams, it means that it is within 15 degrees of a conjunction with the Sun. 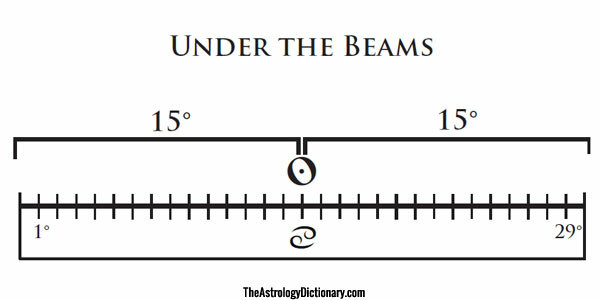 The phrase comes from the ancient Greek astrological term hupaugos (ὕπαυγος), which literally means “under the beams” or “under the rays”.